Joined by Alexej von Jawlensky and Marianne Werefkin, Gabriele Münter and Wassily Kandinsky explored the old marketing town of Murnau on the Staffelsee as a motif of their art during the summer of 1908. "It was a wonderful, interesting, happy period of work with many discussions about art, " Münter later recalled, "We all tried very hard and each one of us matured [in our art]. I made a mass of studies. There were days when I made five studies (the cardboard measuring 33 x 41 [cm.]) and many when there were three, and a few when I did not paint at all. We all worked hard." The painting School House, Murnau, its measurements agreeing with those Münter identified, was one of the results of these radiant summer days. With pencil onto the still wet paint, Münter inscribed the date, 27 VIII (August 27, ) and the Roman numeral "IV" to identify the fourth of her studies made that day. The additional number "18" at the right edge may well inventory the totality of paintings made by her in Murnau up to that time. The painting marks the final transition from Münter's earlier Impressionist-derived work to the Expressionism she, Kandinsky and Jawlensky evolved that summer at Murnau. Depicted is one of Murnau's largest and plainest buildings in a deceptively simple composition, with no more than eight planar elements that are juxtaposed sharply one to another, distinguished by colour and by outline. Colours appear in large, relatively un-nuanced planes enlivened from time to time by small touches of brilliant, intense hues. Simplicity, reduction and balance characterise the work. However, in antithesis to these compositional principles, broad strokes of the brush, thin paint, sketched shapes, bare areas of cardboard, all seem to signify a rapid painting process, a kind of automatic creation that submerges consciousness within an intuitive act of image making. 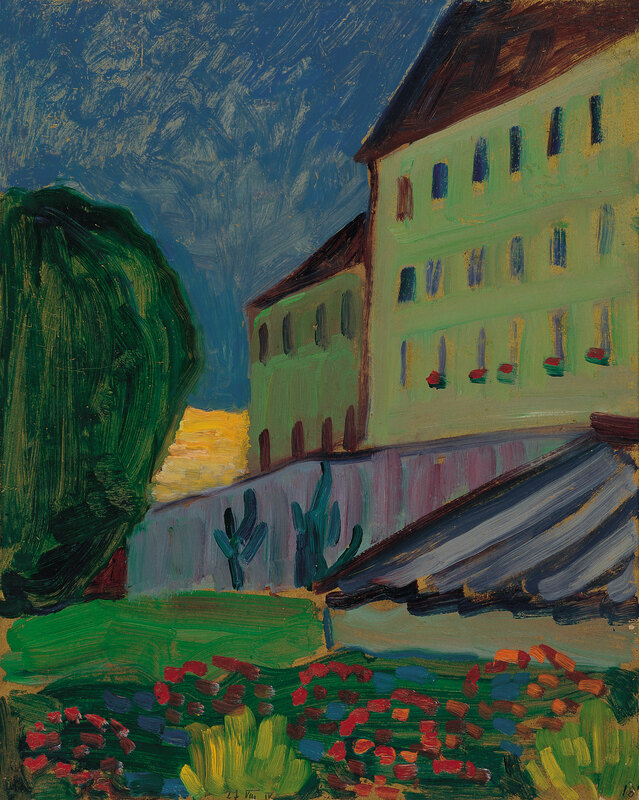 "Most of my successful works were painted quickly and without corrections, " Münter wrote late in her life, "as if by themselves." But this effortlessness was sought and fostered. The sources of Münter's new approach to painting as manifested in Murnau are multiple. In part, her own work in prints foreshadowed effects she explored here in paint. 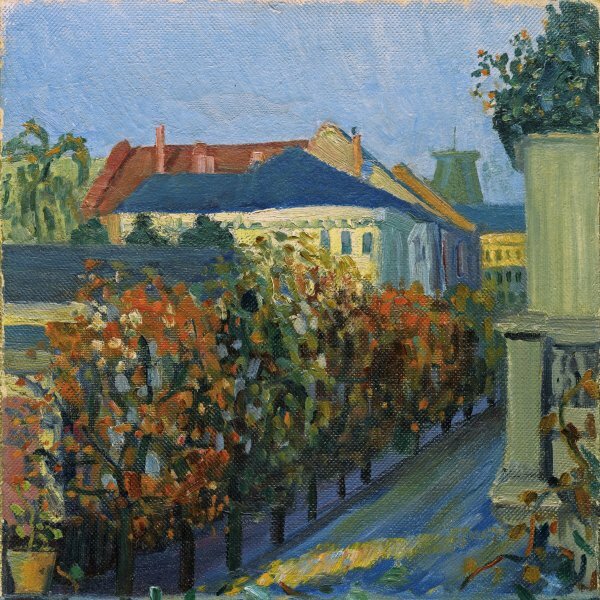 But also an ancestry in the work of Paul Gauguin and Vincent van Gogh is apparent in the composition and in the use of large flat planes of outlined colour; Edvard Munch's sense of colour seems to be the source of Münter's colour usage; and Henri Matisse's fauvist example too served as a model. The complexity of modernist vocabularies to which Münter responded was augmented, moreover, by her discovery of the folk art of Bavarian reverse glass painting with similar formal devices. Eclectic in her approach, Münter achieved the uniqueness of her personal style within the environment of Murnau's narrow streets, its houses ranged close together so that their mass cut off the view of the nearby mountains, its gardens and meadows injecting nature into the geometric realm of human habitation. "After a brief time of experimentation, " she recalled in her diary in 1911, "I took a major leap [in Murnau]-from painting after nature, more or less impressionistically, to the feeling of a content [and] to abstracting, to the presentation of an extract." In Murnau, she evolved in the space of a few weeks in August and September 1908 her mature Expressionist style.